In a bold attempt to reassert Russian influence in the Middle East, Russian President Vladimir Putin has issued an invitation for leaders of the Palestinian Hamas movement to visit Moscow in early March. The meetings will mark a break with the rest of the “Quartet” of Middle-East peace negotiators (the United States, the United Nations and the European Union), who, together with Israel, are calling for Hamas to refute its declared intention of destroying Israel. Further alarming Israel, the head of the Russian General Staff mentioned the possibility of arms sales to Hamas, although Defense Minister Sergei Ivanov soon added that such sales would be made only with Israeli approval. The Soviet Union had a strong tradition of supporting left-wing Palestinian independence movements, and Putin’s latest gambit appears to be part of Russia’s continuing attempt to reclaim an influential role in parts of the Islamic world. Russia’s relationship with Hamas involves policy contradictions for both parties. Hamas has given verbal support to Islamist movements throughout the world. On the other hand, the Kremlin has consistently warned of a vast Islamist conspiracy to create a new Caliphate since the second Russian-Chechen war began in 1999. After 9/11 Moscow began to complain of al-Qaeda infiltration in the North Caucasus, and has characterized the Chechen resistance as a group of Osama bin Laden-influenced radical Islamists. Israel was thus taken by surprise by Putin’s invitation to the Hamas Islamists, and has responded with an effort to convince the Kremlin that Hamas is closely tied to the Chechen mujahideen. Russia’s Foreign Ministry is adamant that the Hamas visit will be used to persuade the Palestinian Islamists to reform their mandate with regard to the existence of Israel. In response to Israeli charges that the meetings contradict Russia’s condemnation of “Wahhabism” (the Russian government’s term for Islamism) Russian diplomats point to their record in Chechnya as proof that Moscow does not support Islamism or the terrorist methods of groups like Hamas. A pamphlet issued by Israel’s Intelligence and Terrorism Information Center (ITIC) alleging common cause between Hamas and the Chechen independence movement is being widely distributed by the Israeli government through its foreign missions. Directed specifically at the Kremlin, the pamphlet relies on material first posted to the Center’s website in September 2004. This material gained little attention when it was first posted, for reasons that seem rather clear. Rather than establishing proof of collaboration between Hamas and the Chechens, the “evidence” consists solely of computer graphics found on discs seized in raids on Hamas-related facilities. 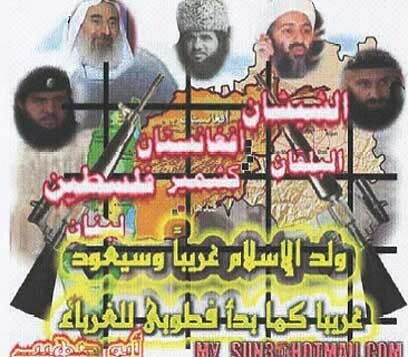 The digitized “posters” contained on the CDs include images of Shaykh Yassin, Osama bin Laden, Shamyl Basayev and the late Saudi mujahid, Ibn al-Khattab. The only other evidence is a confiscated copy of a CD called “Russian Hell in the Year 2000,” a graphic account of early mujahideen activities early in the latest Russian-Chechen war that has been available for order from the internet for the past six years. Palestine is surrounded by Muslim countries who lavishly spend billions on their military. They have the latest generation armored fighting vehicles and state-of-the-art fighter jets but not one bullet have they fired in defense of the Muslims (Azzam Publications, October 9, 2000). The Shari’a requires us to assist those Muslims who are struggling to free the sacred places of Islam—the city of al-Quds [Jerusalem] and the al-Aqsa Mosque. Those belong to all Muslims, regardless of their nation or ethnic group. It is a clear duty of all Muslims to help the Palestinians (Kavkaz.com, October 19, 2000). Ultimately, Russian military pressure vanquished Basayev’s dreams of a Chechen-led liberation of Jerusalem, and neither mujahideen nor money left Chechnya. It is difficult to draw evidence of a sinister conspiracy from a graphic artist’s juxtaposition of images of Hamas, al-Qaeda and Chechen leaders on a handful of posters. They may reveal a certain sympathy among some Palestinians for the Chechen insurgency, but they are not proof of collaboration. Of the many Arabs who have passed through the ranks of the Chechen mujahideen, few have been Palestinian. Young Palestinians seeking jihad do not need to travel. Arab financial aid to the Chechen struggle has always been centered in the wealthy Gulf States rather than impoverished Palestine. The ITIC document declares that Hamas supports a “radical jihad agenda” in Russia. The reality is that Palestine has done little to aid the Chechen cause while the Chechens themselves have proven justifiably wary of groups such as Hamas, which appear ready to abandon the international aspects of jihad when their own interests are at stake. In the end the Chechens are remote non-Arab Muslims whose cause will never resonate with Palestinians in the same way as the ongoing insurgency in Iraq (a neighbor and a traditional center of Sunni Islam and Arab culture). In mid-February of this year, another Hamas delegation made an official visit to Ankara, the capital of Israel’s strategic ally, Turkey. In like fashion to the Russian controversy, outraged Israeli politicians pointed to a Turkish double standard by asking what Ankara’s reaction would be if Israel invited a delegation of Kurdish separatists to Jerusalem. Turkish officials claim that the talks were also intended to move Hamas’ position on Israel closer to that suggested by the “Quartet” while urging Israel to recognize the results of the Palestinian election “and move away from violence” (Zaman, February 18, 2006). Like raising the issue of the Kurdish “PKK terrorists” with Ankara, the recycled evidence of the ITIC is clearly designed to embarrass the Kremlin. In this sense it may be successful, but it cannot be taken as serious evidence of “terrorist cooperation” between Hamas and Chechnya’s mujahideen. Yemen’s U.S.-sponsored fight against al-Qaeda suffered a severe blow last week with the escape of 23 convicts from a high security prison in the capital of Sana’a. Among the escapees were 13 al-Qaeda suspects imprisoned for their roles in the 2000 bombing of the USS Cole and the 2002 attack on the French oil tanker Limburg. On February 5, Interpol issued a global alert that described the fugitives as a “danger to all countries.” The prison break came only one day before the trial date of Muhammad Hamdi al-Ahdal and 14 other al-Qaeda suspects. 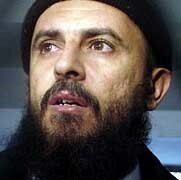 Al-Ahdal is accused of directing the Cole bombers, but was to be tried on charges of financing terrorism. That trial has now been postponed indefinitely. The escape took place February 3 from the Sana’a national headquarters of the Political Security Organization (PSO), Yemen’s leading intelligence agency. The possibility of inside help for the mass escape from Yemen’s most tightly guarded prison has raised the question of whether the state security services harbor agents sympathetic to al-Qaeda. The prison’s previous commander and deputy were dismissed just two weeks ago after two Zaydi militants escaped. Government sources initially claimed that the al-Qaeda fugitives escaped through a 70-meter tunnel that emerged in a nearby mosque (http://www.26sep.net, February 4). Later reports suggested that the tunnel was 140 meters long and was dug from the mosque into the prison. Unlike Yemen’s three other major security agencies, the PSO leadership is recruited solely from military officers and reports directly to President Ali Abdullah Saleh. Like the army, the PSO is believed to include many Salafists and Baathist sympathizers, a legacy of Yemen’s broad support for the 1980s anti-Soviet jihad in Afghanistan and a long alliance with Saddam Hussein’s Iraq (Gulf States Newsletter, December 9, 2005). The U.S. war in Iraq is widely opposed in the officer corps, many of whom were trained in Iraq. The PSO has been accused within Yemen of mass extra-judicial arrests made in an effort to flush out al-Qaeda members. In July 2002, the home of PSO Vice Chairman Ali Mansur Rashid was attacked by armed men seeking the release of “173 Mujahidin” (al-Ahram Weekly, August 15-21, 2002). The escapees included two notable figures. Jamal al-Badawi was charged as one of the main plotters in the strike on the Cole. President Saleh commuted the sentence of death that followed al-Badawi’s conviction to a prison term of 15 years. In politically volatile Yemen, prosecutions are often dependent upon the political consequences of a conviction, and occasional commutations and amnesties are part of maintaining Saleh’s presidency. 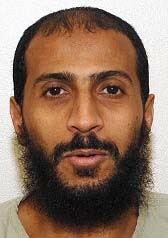 Al-Badawi was one of 10 al-Qaeda members who escaped from an Aden prison in April 2003. Like the prison in Sana’a, this facility was also run by the PSO. Yemen is preparing to try a number of prisoners who are accused of being associated with al-Qaeda terrorist activities in Yemen and abroad. The most notable prosecution involves Muhammad Hamdi al-Ahdal (also known as Abu Asim al-Makki) and his associate Ghalib al-Zaidi, who have been held since December 2003. Al-Ahdal is described as a veteran of fighting in Chechnya and Afghanistan (where he lost a leg) before returning to Yemen to conduct terrorist operations. 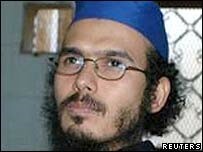 He is a former deputy to Sinan al-Harthi, an al-Qaeda operative killed by an American drone aircraft in 2002. U.S. lawyers from the Center for Constitutional Rights visited Yemen last week to meet with families of the men being held at the Guantanamo Bay prison. A lawsuit is being prepared on behalf of 60 Yemeni citizens still held in the Cuba-based prison. On January 23, it was announced that four men released from Guantanamo a year ago will be tried on charges of being al-Qaeda members. It had been widely expected that the men would be released for lack of evidence. A fifth suspect released from Guantanamo is being tried in a separate action on charges of drug trafficking. Karama Sa’id Khamsan was arrested near the Afghanistan/Pakistan border by Pakistani police and was turned over to U.S. forces in 2001, although it is now alleged that he was there to take delivery of two tons of hashish bound for Yemen (Gulf Times, January 24, 2006). In addition, 19 people suspected of planning the assassination of U.S. officials and planning other terrorist acts in Aden have been delivered for prosecution. The 19 are accused of having returned from jihad in Iraq with orders from Iraqi al-Qaeda leader Abu Musab al-Zarqawi to begin operations in Yemen. There are conflicting reports about the whereabouts of Yemeni businessman and member of the ruling General People’s Congress Abdul Sala’am al-Hilah. Last week, Amnesty International reported that al-Hilah was now in Guantanamo Bay, but the Yemeni Foreign Ministry claimed he was still in a prison in Afghanistan. Al-Hilah told Amnesty that he was kidnapped in Egypt in September 2002 before being transported to prisons in Azerbaijan and Afghanistan (Yemen Observer, January 21, 2006). Also at Guantanamo, another Yemeni was put on trial by U.S. military authorities this month, one of the first two prisoners to face a military commission. In a 10 minute speech before the commission, Ali Hamza Ahmad Sulayman al-Bahlul denounced American support for Israel, declined the services of his court-appointed U.S. military lawyer (who faced four prosecutors) and declared a boycott of the entire proceedings. Al-Bahlul was a media specialist for Osama bin Laden who created a video lionizing the al-Qaeda attack on the USS Cole in Yemen in 2000. Additional charges of conspiring to carry out terrorist activities means al-Bahlul could face a life sentence. The trial has been adjourned until May 15. The government of President Ali Abdullah Saleh has been one of the United States’ staunchest allies in the war on terrorism. Yet, while the Yemeni government cracks down on Sunni terrorism, it faces renewed fighting from Zaidi Shiite rebels in the mountainous north of the country. The insurgents, who ambushed an army column on January 19, are believed to be ex-followers of preacher Husayn al-Huthi, who was killed along with many supporters in battles with security forces in 2004. The renewed attacks are sure to disappoint the government, which has made concerted efforts at reconciliation with the restive North.